Jupiter is twice as massive as all the other planets of the Solar system combined. Discover the might and beauty of the biggest planetary object in our Solar System. You will be deeply impressed by the highly realistic image of the largest planet of the Solar system. Site license allows using IconEdit2 in a business environment by multiple users at a single location. Business license allows using IconEdit2 in a business environment by one user. THOR screensaver THOR SCREENSAVER brings an animated collection of images featuring the Marvel character Thor and his companions. The software can display a slideshow of pictures from comics, posters, concept art and movie stills, accompanied by the Thor theme song. A calendar and a clock can also be displayed on the screen while he screensaver is active. The slideshow can easily be customized, from the Settings window. You may thus set the period of time your computer remains idle before the screensaver automatically opens, as well as the duration of each slide. The order of display for the slides can be sequential or random. Moreover, the images can automatically be resized when the screensaver is active. Amazing full-screen picture slide show screensaver that demonstrates enhanced features,All the latest graphics,theme,song including cool 3d & constant movement effects. includes clock calendar OTHER OPTIONS & SETTINGS All screensavers are free downloads and safe to download and run! ITEM#38 FIREWORKS SUPREME SCREENSAVER This fireworks display screensaver was created from a live actual awesome display with beautiful and colorful array of images and patterns with sound and music background a must see ! File size 53.1MB with OTHER OPTIONS & SETTINGS Awesome!! 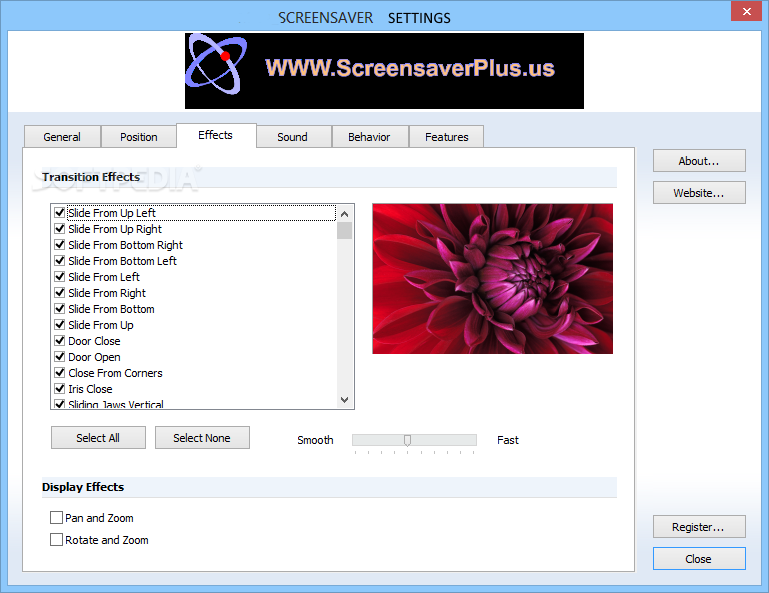 w/hide & display options with more features & settings ,easy install/uninstall All screensavers are free downloads and safe to download and run! The X-Men SCREEN SAVER V 3.7 The X-Men film series consists of superhero films based on the Marvel Comics so we created a screensaver of it for you. Awsum!! screensaver LATEST image effects Some 3D ,theme music Stunning graphics,theme song clock & calendar w/hide & display options with more features & settings ,easy install/unistall All screensavers are free downloads and safe to download and run! Windows System Launch V 4.6 Syslaunch is a tool that builds a mini ‘start menu’ in your system tray, most peoples start menus are just over crowded (like mine) so this program is to get to the programs they use the most easier and faster! Note : You Must adjust your anti-virus setting to EXclude this software from sonar ,just a couple of clicks and your done.! Website Data Extraction TOOL Please note: these are free downloads but you still need to purchase the Regkey serial number key for unlocking your software,to finish the install process. All : Windows, including Windows 8, & 8.1 /7,ME,XP, VISTA,2000. Darkshadows Revival series Screensaver Dark Shadows (later referred to as Dark Shadows: The Revival) is a primetime television series which aired on NBC from January to March 1991. A re-imagining of the 1966?1971 ABC daytime gothic soap opera Dark Shadows, the revival was developed by Dan Curtis, creator of the original series So we created a screensaver of it for you. Awsum!! screensaver LATEST image effects Some 3D ,theme music Stunning graphics,theme song clock & calendar w/hide & display options with more features & settings ,easy install/unistall All screensavers are free downloads and safe to download and run! ITEM#33 Darkshadows Original series Screensaver Dark Shadows is an American gothic soap opera that originally aired weekdays on the ABC television network, from June 27, 1966, to April 2, 1971. The series became hugely popular when vampire Barnabas Collins (Jonathan Frid) appeared a year into its run. Dark Shadows also featured werewolves, zombies, man-made monsters, witches, warlocks, time travel, and a parallel universe. So we created a screensaver of it for you. Awsum!! screensaver LATEST image effects Some 3D ,theme music Stunning graphics,theme song clock & calendar w/hide & display options with more features & settings ,easy install/unistall All screensavers are free downloads and safe to download and run!